Interesting distortions can be made by photographing reflections in irregular surfaces of glass or mylar. They can also be produced by passing either the image forming light either at the taking or printing stage through prisms or transparent materials having nonhomogeneous composition. Both of these methods depend on altering the normal, expected or standard behavior of image forming light rays at the instant in time that the picture is made. Another technique for creating distortions involves the use of a fine slit that moves past the film at the time the picture is made. In fact, a focal plane shutter is just such a device and the distortion produced by these shutters is fairly well understood by photographers at large and the distortions thus produced are called focal-plane shutter distortion. As a matter of background, it is generally impossible to tell whether a photograph was made with a leaf or diaphragm shutter or with a focal plane one. Unless the focal plane shutter is not functioning well the statement above is almost invariably true. The one condition under which it starts to become possible to differentiate and identify the kind of shutter that was used to make a given photograph is when the subject is not stationary but is in motion. If we simply concentrate on the subject then the statement must be modified and what must happen is that the image of the subject must move with respect to the film while the exposure is taking place in order to be able to pick up the characteristics associated with focal plane shutter distortion. Below are a series of idealized results that might be produced with leaf, diaphragm or, in the digital realm, "global shutters" and with focal plane shutters or "rolling shutter" type digital cameras. Notice that the images associated with leaf shutters simply exhibit what might be called motion blur while the ones made with a focal plane shutter the results show not only blur but also a distortion that is associated with the essentially "scanning" nature of such shutters. <>To understand just why focal plane shutters distort rapidly moving images one needs to simply establish that a moving slit shutter takes some time to travel across a stationary image of some subject. If the image then moves in the same direction as the slit shutter is moving then the shutter will take longer to traverse the image of the subject than under the previous condition and this will produce on the film a stretched out image of the subject. On the other hand, if the image is moving in the opposite direction as the focal plane shutter slit, then the shutter curtain traverses the subject's image in less time than if the image had been standing still resulting in a compressed version of the subject. Movements at right angles to the motion of the slit introduce tilting of the subject either in the direction of motion of the subject or in the opposite direction depending on the direction of motion of the shutter slit with respect to that of the subject's image. 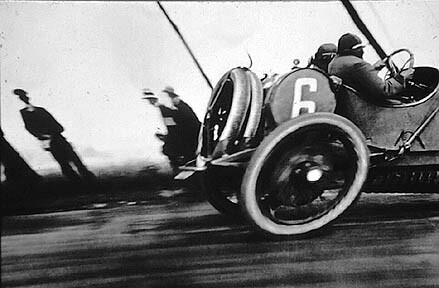 A very famous photograph that depends on focal plane shutter distortion for its visual impact is one made by Henri Lartigue with a large camera equipped with a focal plane shutter. The photo shows a race car leaning in one direction while spectators and telephone poles included in the picture are leaning in the opposite direction. This indicates that the camera was panned causing the background to tilt one way while the panning speed was not fast enough to keep up with the vehicle thus causing the race car to lean in the opposite direction. Close examination of the degree of tilt in the image seems to also indicate that either the car changed velocity, the camera was not panned at a constant velocity and/or that the shutter curtain velocity across the film gate was not quite constant. 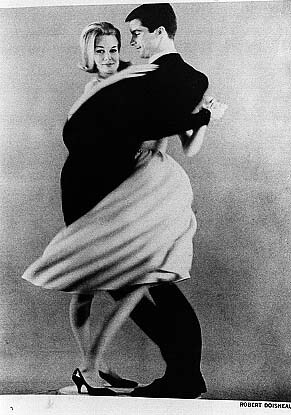 Another photographer who took advantage of the characteristics of focal plane shutter distortion but in a more controlled way was Robert Doisneau who photographed a couple spinning on a turntable as a slowed down focal plane shutter exposed the scene sequentially from one edge of the film to the other. Now one might wonder why it is that there is no significant body of work that illustrate the effects of focal plane shutter distortion. It turns out that the reason for this is that most focal plane shutters traverse the film plane quite quickly in relationship to the speed at which the images of most subjects move along on the film. It is important to realize that this is not related to the fact that one can achieve short exposure times with focal plane shutters since short times can be achieved by making the shutter slit very narrow. The reason is that modern shutters have better springs and other mechanical characteristics that allow them to accelerate and decelerate more rapidly than in older shutters. Focal plane shutters associated with 4x5 Speed Graphic and Graflex cameras move much more slowly than today's 35mm camera shutters. 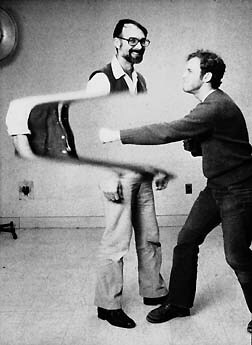 Some photographers purposely slowed the shutter tensioning down to achieve startling focal plane shutter distortion effects. Some of these cameras may even be still in use today. Finally, there have been many amateur and also some commercial photographers who have devised ingenuous means for introducing focal plane shutter distortion by modifying their 35's, their Wideluxes or related cameras, or simply building matte-boxes that were fitted with a moving slot to produce a piecemeal but continuous exposure of the film. Which brings us to the illustration at the top of this article! It was made with a home-built moving slit type matte box shown in the illustrations below. The device reminds one of an oversized lens shade and consists of a 12 inch cube made out of plywood that has an open front and on the back wall it has a hole through which the camera lens looks into the box. The open front of the box is flanked by a pair of "L" shaped, metal (could be some other material!) "lips". These are attached to the box edges in such a manner that they reach over the edges forming a channel. Within this channel, and covering the open front of the box rides a 12 inch by 3 foot opaque, black, cardboard has been cut mask into which a slot about 2 or 3 millimeters in width and extending almost the full width of the mask. Because this leaves a very weak connection at the edges, a piece of clear glass is glued across the slot to strengthen the mask and prevent the slot from breaking or varying in width once tensioned when the mask is placed in motion. 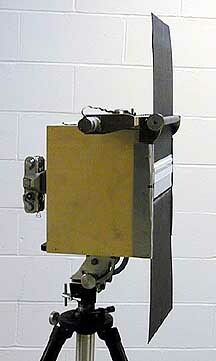 In the slit-scan box illustrated here the mask is moved by passing it between rubber coated rollers, one of which is motorized. In this case one of the roller's shafts as well as the motor's shaft are fitted with sprocketed belt drive gears and a flexible sprocketed belt connects the two. 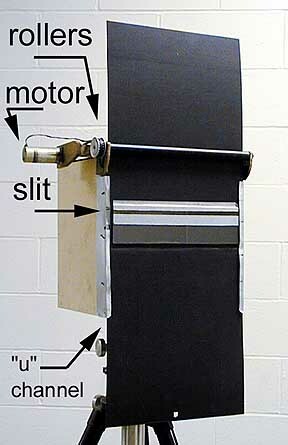 The motor is a 24 volt DC gear head, high torque, motor. It can be operated at variable speed by simply powering it at lower than maximum voltage and it can be made to move the mask up or down by the simple expedient of reversing the polarity of the voltage supplied to the motor. 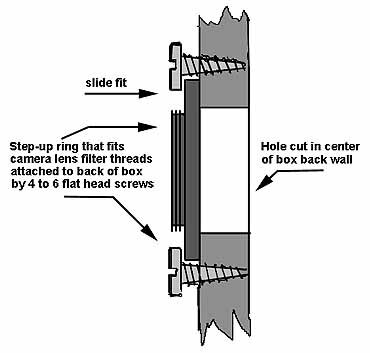 As shown in the illustrations and the drawing, the camera is firmly attached to the box by screwing the lens onto a step up ring that has threads onto which the lens can be screwed and whose outer flange is kept attached to the box by four or more flat headed screws whose heads reach over the ring's edge and that are screwed into the box just enough so that the ring can still turn. The fit should be snug. This will allow the camera to be turned to suit the photographer but still prevent the camera from detaching itself from the box accidentally. Just don't knock the camera off the ring's threads! The scheme for moving the mask could be something very basic and I recommend that you strongly consider a simple "pulling" mechanism as shown in the attached drawing. To use this moving slit matte box you simply aim the box/camera combination at some location where there will be some uncontrolled or contrived action. Generally you would place the box/camera assembly on a sturdy tripod to make sure that the camera remains pointed at the area of interest. You then move the mask so that the slot is either at the very top of its travel or the very bottom, depending on where you want the exposure to start. At this time you open the shutter of the camera and lock it open. 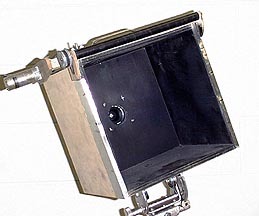 Since the camera is looking into the black box the film is not being exposed at all. Now you power-up the motor and the mask starts to move, hopefully in the right direction (if not then reverse the polarity of the power to the motor) across the open end of the box. As it moves, different areas of the scene in front of the camera will be exposed sequentially on the film. Much like if the exposure had been made with a slit moving at the film plane. It is recommended that you use a fairly small aperture to make the slot sharper, its edges better defined, than if you use a large aperture on the camera lens. This makes the edges of moving objects more distinct and the slit-scan effect more obvious and dramatic. Determining proper exposure is a bit of a trial and error situation since the slot has a tendency to interfere with the aperture that you are setting your lens to and thus the amount of light at the film plane will not be quite what one would expect for any given aperture. 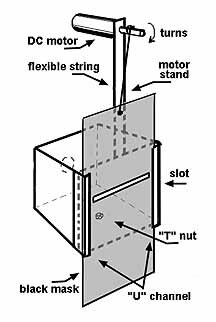 In any case, one can start with determining the exposure time by dividing the width of the slit by the rate at which it moves at the voltage you will be operating the motor. It helps to make oneself a chart of voltages vs. exposure times and attaching it to the side of the box. Because during the time that an exposure is actually made the shutter is blocking the viewfinder it is often necessary to choreograph the event that one will be photographing. The subjects will need to be given directions as to when and how to move and when to do it in relation to the position of the slot on its way across the field of view of the camera. One solution might be to use a camera such as the Canon RT or the older Pellix which have fixed, semitransparent mirrors that do not move during exposure. These would allow the photographer the opportunity to see in the viewfinder the relationships between the moving image of the slot and the subjects in front of the camera. In any case, this slit-scan photography matte box is a wonderful special effects device. It is intended to produce images that will, to some extent, startle an audience and make them ask "how did they do that?!". If you'd like to communicate with me about this topic simply send me e-mail. Andrew Davidhazy - andpph@rit.edu or by clicking HERE!.